When booking an overnight trip with Day Tripper of Duluth, all you need to do is choose your activity and duration, we take care of the rest! When you arrive to the campgrounds after your day of exploration, your guide will help set up the tents & get the campfire going. Kick back & relax as you admire the glow of the Milky Way with the occasional passing meteor; and with luck, you might catch a glimpse of the Aurora Borealis (Northern Lights)! Lodge-to-lodge trips are available for biking & hiking overnight trips. Our overnight trips are fully-outfitted. This means we bring your camping equipment including a tent, camping packs, a camp kitchen, and other general camping supplies. You will also be provided with high-quality gear for your adventure. From paddle to packs, we bring it all! Our guides will prepare delicious meals with a local flair. If you have any specific dietary needs (food allergies, gluten-free, vegetarian, etc. ), we will be happy to accommodate. Breakfast and dinner are prepared by the guides at the campsites. During the travel, we'll stop along the way for a trail lunch. We will be well stocked with snacks and drinks to help keep your battery charged. We will also provide a variety of beverages including: locally roasted coffee, water, and evening drinks of choice. Day Tripper of Duluth offers fully-outfitted overnight kayak camping trips along Minnesota's North Shore. Kayak camping trips are offered June through October. You guide(s) will plan a point-to-point kayak trip so you'll experience new waters every day. You'll kayak during the day and spend your evening relaxing by the campfire while your guides set-up camp and prepare delicious meals. You will be provided with high-quality gear that includes a kayak, a paddle, a PFD (life vest), a wet suit, and a spray skirt. We have touring/expedition kayaks that are designed for performance and have more capacity than recreational kayaks. The design of the kayaks offers increased speed, maneuverability, and gear storage while maintaining a relaxed fit to keep you comfortable during your adventure. The predictable handling allows both beginners and experts to venture on long excursions in a variety of types of water. We recommend that solo paddlers be at least 13 years of age unless experienced in solo kayaking. We have tandem (two person) kayaks available for younger children (1 adult and 1 child per tandem kayak) and for those that who wish to paddle with a partner. * Pricing varies by accommodations. * Prices vary based on number of participants, trip duration, and location. When booking your trip, you can determine the number of campers, trip destinations, lodging style (lodge-to-lodge trips available), and trip duration (2-night minimum). The price is based on your custom itinerary. Prices listed are for tent camping and 3 days/2 nights per paddler. • Lunch & packing up for return drive to Gooseberry Falls. The Lake Superior water trails is a great option for kayakers of all skill levels. With overnight options ranging from back country campsites to grand lodges we can make your paddle as adventurous or relaxed as you want! Day Tripper of Duluth offers fully-outfitted overnight canoe camping trips in the Superior National Forest and the Boundary Waters Canoe Area Wilderness (BWCAW). Canoe camping trips are offered May through October. Your guide(s) will plan a loop trip (end where you started). Enjoy the pristine Northern wilderness as you canoe and portage along ancient fur trade routes. After your day of travel (and fishing along the way if you'd like), your evenings will be spent relaxing by the campfire while your guide sets up camp and prepares delicious meals for you. You will be provided with high-quality gear that includes a canoe, a paddle, and a PFD (life vest). We have touring canoes that are designed for performance and comfort. They are light-weight, stable, maneuverable, and will haul plenty of gear. They are perfect for novice paddlers and for families with young children, yet they have the speed and precision that experienced canoeists will appreciate. We recommend paddlers be at least 10 years of age unless experienced in canoeing. Duffing, or riding in the boat's center compartment, is a great beginning place for all young paddlers. Though duffers may not be helping to propel the boat, they are learning about the feel of the boat. Prices vary based on number of participants, trip duration, and location. When booking your trip, you can determine the number of campers, departure location (Sawbill, Brule, Seagull, etc), and trip duration (2-night minimum). The price is based on your custom itinerary. Listed below is for the price for a Sawbill BWCA 4-day/3-night Canoe Camping Trip. • Afternoon exploration of campgrounds, nearby islands, fishing, etc. Day Tripper of Duluth offers fully-outfitted overnight bike camping trips in the Superior National Forest. Bike camping trips are offered May through October. Your guide(s) will plan a route tailored to your riding style. Enjoy the pristine Northern wilderness as you pedal rarely used gravel roads and trails. After your day of travel, your evenings will be spent relaxing by the campfire while your guides set up camp and prepare delicious meals for you. You will be provided with high-quality gear that includes a bike and helmet. We have high quality hardtail mountain bikes that will insure a comfortable and efficient ride. We recommend riders be at least 13 years of age unless experienced cyclists. You won't need to worry about hauling you gear, our guides will provide gear transportation via vehicle to the next campsite. All you need to do is enjoy the ride! Prices vary based on number of participants, trip duration, and location. When booking your trip, you can determine the number of campers, trip location, and trip duration (2-night minimum). The price is based on your custom itinerary. Listed below is for the price for an Boreal 3-day/2-night Bike Camping Trip. • Stop by Coho Cafe in Tofte for dessert and coffee. Day Tripper of Duluth offers fully-outfitted overnight hike camping trips along the Superior Hiking Trail. Hike camping trips are offered May through November. Your guide(s) will plan a point-to-point trip so you'll explore new trail every day. After your day of trekking through the Laurentian (and maybe the Boreal) Forest, your evenings will be spent relaxing by the campfire while your guide sets up camp and prepares delicious meals for you. You will be provided with high-quality gear that includes a backpacking packs, camping gear, and binoculars to share. Hiking is a great family activity. We recommend hikers of all ages join! Activities such as measuring the age of towering white pines and bird watching will keep the youngsters entertained. Let us know if you're interested in snowshoe winter camping during the snowy season. Prices vary based on number of participants, trip duration, and location. When booking your trip, you can determine the number of campers, lodging style (lodge-to-lodge trips available), and trip duration (2-night minimum). The price is based on your custom itinerary. Listed below is for the price for a North Shore 4-day/3-night Backpack Camping Trip. • Pack backpacks & hit the trail! Day Tripper of Duluth offers fully-outfitted urban overnight bike trips in Duluth. With close to 100 miles of trail to choose from we will find plenty of dirt to ride. Your guide(s) will plan a route tailored to your riding style. Cruise down the flowy Duluth Traverse or test yourself on steep rock rolls. After your day of riding, your evenings will be spent exploring what Duluth has to offer. You will be provided with high-quality gear that includes a bike and helmet. We have high quality hardtail mountain bikes that will insure a comfortable and efficient ride. We recommend riders be at least 13 years of age unless experienced cyclists. You won't need to worry about hauling your gear, our guides will provide gear transportation as requested. All you need to do is enjoy the ride! 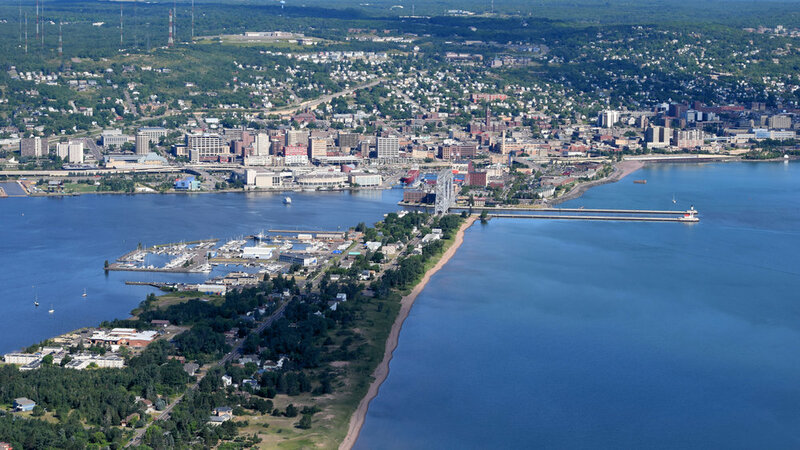 In addition to many hotels, Duluth has some great camping options to choose between. Options include Jay Cooke State Park, Spirit Mountain, or Indian Point. Prices vary based on number of participants, trip duration, and location. When booking your trip, you can determine the number of adventurers, trip destinations, lodging style, and trip duration (2-night minimum). Prices listed include camping costs, additional lodging fees for hotel or other room will be added if desired.